Having finished my first book on endangered primates, I decided to write a second that would concentrate on the best-known non-human primate species of all: chimpanzees. In order to write such a book, though, I needed someone who could advise and guide me on the subject. I thus contacted the chimpanzee expert Geza Teleki, and went out to his home in Washington, D.C., for our first meeting. After some preliminary discussions, he asked the question that apparently had been on his mind all along: “Would you be interested in writing a book with Jane Goodall?” Jane Goodall, the world’s foremost authority on wild chimps, was hoping to produce a book about the human relationship with chimpanzees—both conservation and ethics, in other words—and she needed a professional writer. She had the expertise but not the time. I had the time without the expertise. That’s how the collaboration began. The research took me over a broad area of chimpanzee territory in Africa, then into the prison-like atmosphere of captive chimp habitat in America—to private homes and strange personal zoos, crude Hollywood animal rental operations, good and bad biomedical research laboratories, and so on. Meanwhile, I was seriously worried about lawsuits, given that one of the villains in the larger story was a notorious Austrian laboratory that had already sued more than 60 individuals and organizations for writing various versions of the same tale I was trying to tell. Since I had discovered that the central character in Shakespeare’s play The Tempest—a half-human and half-animal “monster” named Caliban—was probably inspired by the first reports to arrive in England of wild chimpanzees in Africa, I decided to use Shakespeare’s play as a device for structuring the book. That worked well, I think, and I always had the pleasant thought that no one in his right mind would sue Shakespeare and Jane Goodall simultaneously. 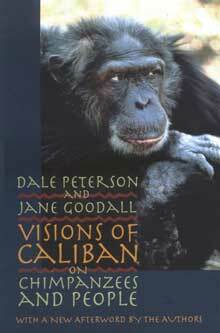 Visions of Caliban was a New York Times Notable Book of the Year and a Library Journal Best Book of the Year. It has been translated into Chinese, German, and Polish, and was reissued in 2000 by the University of Georgia Press.